Then you can do this for free and it will only take a matter of seconds! You do not need any equipment or data cables. Take 5 minutes to read through the following section called - Remote Unlocking . How does remote unlocking work? 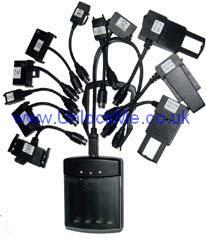 IT IS VERY EASY TO UNLOCK YOUR PHONE USING UNLOCK CODES, IN FACT THIS IS HOW THE NETWORKS THEMSELVES UNLOCK HANDSETS! So you fancy generating your own unlock codes? And why not you can make a few quid by selling unlock codes to friends and family etc. Recently the software that generates these unlock codes has become available for FREE!!!!!!!!!!!!!!! Read My Step by Step Remote Unlocking Tutorial Here! At present the most mainstream DCT4 unlocker is a piece of software from JIC. This unlocker was actually stolen from a company called JIC Electronics a little while back. It is very easy to use as it consists of only one button! Nokia are continually improving the software within their handsets. Mainly these improvements consist of small bug fixes but recently Nokia improved the service provider lock protection. This software works on all operating systems, BUT on XP you may need to right click the executable file, select properties and change the compatibility mode to windows 98. JIC software works 100% with pure Mbus cables and does not work with M/F bus cables. 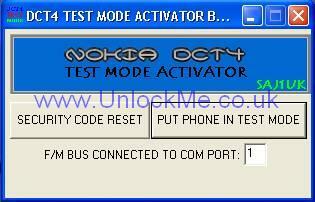 (The software cant put the phone into test mode when using M/F bus cables). But there is a way to make the program work with auto switching M/F bus cables, so read on! What if you have an M/F bus? When you click the unlock button on the JIC program the phone is already in test mode therefore the program can now successfully unlock your handset. What software versions can be unlocked using the JIC Software? These clips are constantly updated to unlock the newer software versions. The latest variety of these DCT3 +DCT4 clips will even unlock the 7650!!! You must be very careful when purchasing unlocking clips. Do not buy the older varieties which are now limited in the software versions they unlock. Always ask for details of what can and cant be unlocked with the clip you are buying! Where to Buy Unlock Clips?